Please do not leave your yoga block in the change room over night. If you dancer does not have a locker, then they should be keeping their yoga blocks in their bags and taking them to and from the studio. Yoga blocks left overnight will be put into the lost and found which we go through and get rid of every few months. If your dancer would like to keep their yoga block at the studio, you may rent a locker. Level 1 classes are running on Friday October 26th and Saturday October 27th. Dancers in NUVO should be attending their level 1 classes on Friday October 26th. Dancers in NUVO should attend the NUVO convention on Saturday and Sunday and will therefore miss Saturday classes. Miss Jenn and a few other teachers will be at NUVO for the whole convention (Friday, Saturday, Sunday). This is who you will look for to receive your wrist band and registration info. Don't forget that all dancers need to have a parent present the WHOLE time during this convention. You will receive your observer pass at registration. Dancers should we wearing items that are appropriate to the class style. For example, wear ballet tights, shoes and bodysuit to Ballet with a ballet bun. For hip hop, do not wear a ballet bun - wear something baggy and more funky. We expect our dancers to look the part this weekend! All dancers should be wearing their new jackets to NUVO. This year NUVO is offering FREE classes to parents on Saturday morning! If you are dropping your dancer off and want to take some classes yourself, stop by the classes! Halloween costumes are not permitted in any Level 1 classroom. This is why we give dancers Halloween off (no classes Wednesday October 31st)! So they can still enjoy wearing their halloween costumes and not worry about coming to dance on that day! If your dancer is in a REC class, they can wear their halloween costume to that class as long as they can move easily in it. Rack and Roll - Deal! 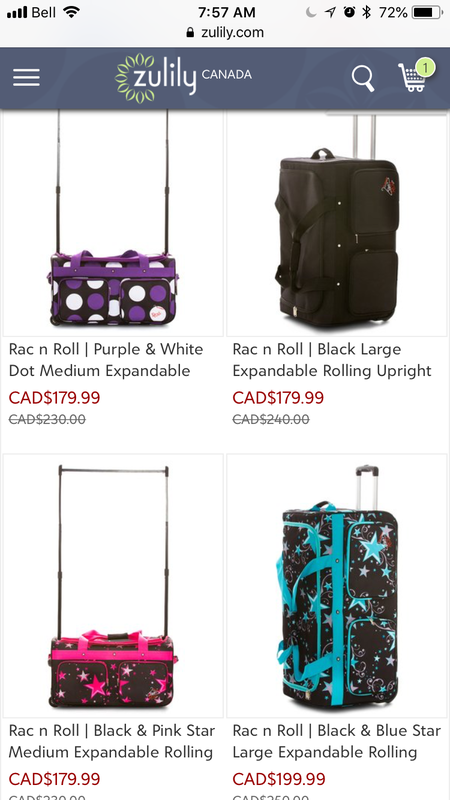 We found this deal for any dancers/ parents wanting to purchase a Rack and Roll bag for competitions and shows. These are super handy if you dancer has a few routine that they are performing. Make sure you are following us on Facebook and Instagram! We post super fun stuff, promotions, and behind the scenes looks at classes.